How Do British Teams Prospects Shape Up In The Champions League? 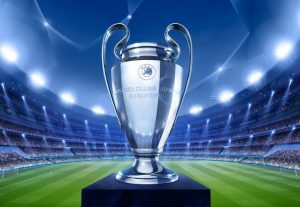 Tuesday and Wednesday evenings this week will see the penultimate round of fixtures in the Champions League Group Stage completed. Matchday Five will be a pivotal one for many teams, some earning their place in the next phase of the competition, others possibly eliminated with most heading into Matchday Six with at least something to play for. For the four British teams involved it could be a pivotal night. For two, they could confirm themselves as through to the next round, for the other two teams, it is about giving themselves a chance to progress into the knockout phase by landing a positive result this week and then taking things to the final Matchday Six. 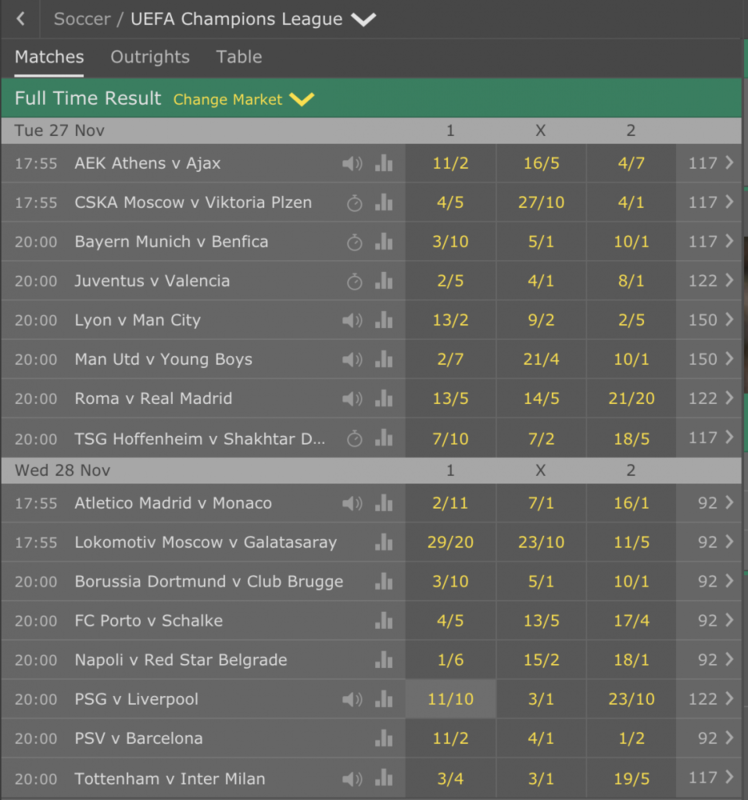 Of course, such a big night of football action will see plenty of money wagered on the outcome of the games and if you fancy a flutter then bet365 Sport is a great choice. If you are not yet a customer, sign up today and you can take advantage of the bet365 Sport New Player Bonus Offer, which could see you earn up to £100 in bet credits when you join. The action begins tonight with the two Manchester clubs in action as Manchester United face Young Boys at Old Trafford in a game which if United win, could well see them confirmed as qualified from the group (assuming that Valencia don’t beat Juventus in Turin). Similarly, Manchester City travel to Lyon knowing that a point will confirm them in the next phase of the competition and a win will ensure that they finish top of their group. The following evening, Liverpool head to France to face Paris St Germain in what is a crucial game in. Group C with all four teams, including Napoli and Red Star Belgrade, still in with a fighting chance of making the knockout phase depending how results go over the last two Matchdays. The action is rounded off at Wembley where Tottenham face a must win game with Inter Milan to keep their slim hopes of reaching the knockout phase alive. After their superb win over Chelsea at the weekend, which ended Mauricio Sarri’s team unbeaten record, can Spurs produce another great performance here to keep their Champions League hopes alive? In addition to these games there is also a lot of other key games on the two night’s of action as you can see from the full fixture list below. All games outlined below involving the British teams will kick off at 8pm on both nights of action. When these two teams met in September Lyon inflicted Manchester City’s only defeat of the season on them with a 2-1 win at the Etihad, but since then City have been imperious in all competitions, while Lyon have only managed to draw their next three Champions League games. The French side are certainly capable of scoring goals, as they have shown in all their Champions League games so far, but they also have an alarming propensity to let a few in at the other end, a fact which has cost them several points in the group so far and something that will be a real achilles heel against a team like City. City will have Pep Guardiola on the bench once again for this game after he was forced to sit in the stands for the last game between the teams and I think that will make a big difference to this City team. 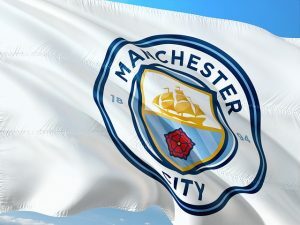 With a win securing City not only qualification but top spot in the group, I think Guardiola will want a win here to be able him to rest a number of key players in the run up to the busy festive period of fixtures in England and in truth, I can’t see any other result other than a City win here. After a superb win over Juventus in Turin last time out, Manchester United know a victory here could well see them qualify for the second phase, if Juventus manage to avoid defeat at home to Valencia in the other game in the group. In truth, even despite their poor 0-0 draw with Crystal Palace in the Premier League at the weekend, this is a game that United fans should see a bit more attacking intent from their team especially seeing as United won the reverse fixture 3-0 in Switzerland on the opening night of Group Stage games. Young Boys earned their first point against Valencia at home last time out but the Swiss side have been outclassed in this difficult group and it is hard to see them matching that result, or doing better at Old Trafford tonight. As such, I think United will put in a steady display and win the game and with it, I think they’ll ensure they qualify for the next stage of the competition. After their disappointing 2-0 defeat to Red Star Belgrade last time out, Liverpool dropped to second in Group C behind Napoli on head to head record and with PSG just one point behind them in third and Red Star now two points further back, it could not be tighter heading into the final two group games in Group C.
For Paris St Germain, they know that nothing less than two wins in their last two games could be enough, especially with Napoli facing Red Star Belgrade at home in a game the Italian side should win. If they do then a win for PSG becomes all the more important here. Liverpool have been very poor on the road in the Champions League so far, but they have to improve here. A defeat would leave them needing a likely two goal victory in the final game of the group at Anfield against Napoli and that is a very big ask. However, PSG do look very susceptible on the counter attack as Napoli have proven in their two games against them and as such, I am backing the Reds to emerge with a creditable point from the game to bolster their qualification hopes. 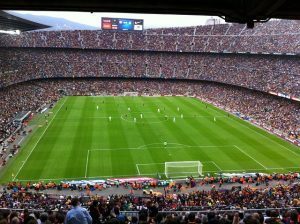 To qualify, Tottenham need to beat Inter Milan by better than the 2-1 scoreline Inter beat them by on the opening week of fixtures and then Spurs need to go to Barcelona and secure three points in the Nou Camp against the Catalan giants, which is a huge ask. Inter Milan need just a point in this game to almost make certain of their progress into the next phase, although if PSV beat Barcelona, they may still need a positive result over PSV to claim that spot in their final game. It is a huge ask for Spurs, but Mauricio Pochettino’s men come into this game on the back of a superb performance and fantastic victory over Chelsea at Wembley at the weekend, inflicting Chelsea’s first defeat of the season on their fellow Londoners. As such, I think Spurs fans will really be up for this one and with Alli and Eriksen back in the fold, I think Spurs chances of landing the win are much improved than they would have been a few weeks back.